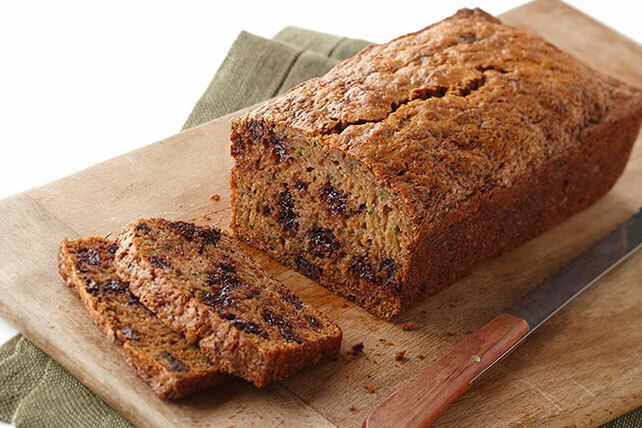 Our zucchini loaf was moist, tender and delicious all on its own. But with chopped chocolate, it's moist, tender, delicious—and chocolatey. 1. Whisk egg and dressing in large bowl until blended; stir in zucchini. Combine remaining ingredients in separate bowl. Add to zucchini mixture; stir just until moistened. 2. Pour into 8x4-inch loaf pan sprayed with cooking spray. 3. Bake 50 min. or until toothpick inserted in center comes out clean. Cool bread in pan 10 min. Remove from pan to wire rack; cool completely.